By the end of the Napoleonic wars Larrey, the son of a humble shoemaker, was famous for his medical skill, his innovations in the field of battlefield medicine and his devotion to his patients. Born in 1766, it was on his father’s death that he went to live with his uncle who was a surgeon. Deciding on a career in medicine he was a medical student in Paris when Revolution erupted in France. Fully believing in the ideals of the Revolution he took part in the storming of the Bastille in 1789. In the early years of the Revolutionary Wars Larrey served in the Army of the Rhine and it was there that he noted the speed at which horse-drawn artillery could move around the battlefield. Convinced that speedy treatment of battlefield wounds was the best way of saving soldiers’ lives he proposed the construction of lightweight carts which could be driven into the thick of the fighting to retrieve wounded and get them to the surgeons as fast as possible. During the next couple of years he developed his design and ideas for the use of what he called his “flying ambulances”. Each vehicle was manned by teams trained in first aid who would perform basic patching up of the wounded before transporting them back to central stations manned by surgeons and their medical staff. There, the injuries were assessed and the patients prioritised based on the nature of their wounds rather than rank, prestige or even nationality. In effect Larrey invented the practice of battlefield triage as we know it now. In 1797 Bonaparte requested Larrey’s transfer to the Army of Italy and thereafter Larrey was closely associated with the man who was to become First Consul then Emperor. At the end of the abortive Egyptian campaign when Bonaparte decided to abandon the army and return to France, Larrey was one of the few who Bonaparte selected to accompany him but Larrey declined, insisting that the wounded soldiers left behind needed him more than Bonaparte. Napoleon duly accepted the doctor’s suggestion and Larrey stayed behind. After the surrender of the French army he was finally repatriated to France and immediately promoted and made Chief Surgeon to the Consular Guard. From 1805 for the next ten years Larrey was constantly on campaign. At Eylau in 1807 the Russian attack on the French flank nearly overran Larrey’s field hospital. Refusing appeals to evacuate, he calmly carried on with his operations insisting that he would die with his patients if necessary. 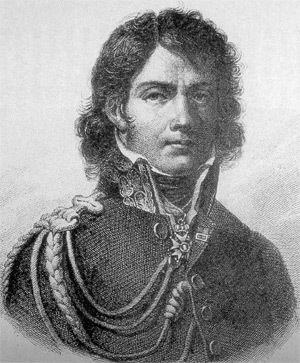 It was only the last minute counter-attack by General Lepic’s cavalry that saved the situation and Lepic was only able to ride because of the treatment he had received from Larrey that very morning. In 1809 during the battle of Aspern-Essling he personally amputated the legs of his close friend Marshal Jean Lannes who had been struck by roundshot. 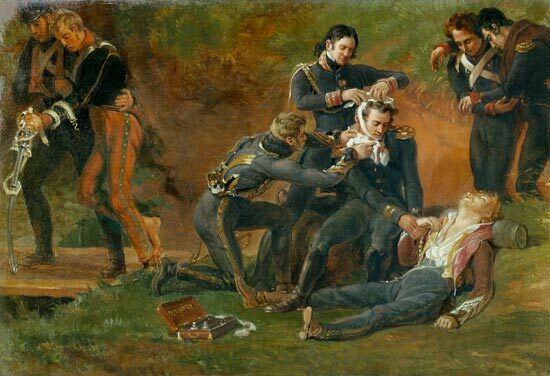 Despite the emotions of performing the procedure on a friend, Larrey carried out the operation impeccably but the wounds became infected and despite his best efforts Lannes died six days later. Larrey hadn’t left his friend’s side for the last three days of his life. Rewards followed for Larrey. He was made Companion of the Legion of Honour and Baron of the Empire. But more important to him was the esteem in which he was held by the soldiery. This was to save his life in Russia in 1812. Larrey continued to serve through the campaigns of 1813 and 1814 and when Napoleon escaped from Elba in 1815 Larrey came back to serve the Imperial Guard again. At the end of the battle of Waterloo when the French were in full retreat Larrey was cut down by a troop of Prussian lancers and left for dead. When he regained consciousness and tried to head away from the field he was captured by more Prussians. He was about to be peremptorily shot when the Prussian surgeon recognised him (he had attended some of Larrey’s lectures) and persuaded his commanding officer to spare the French doctor. The Prussian agreed and sent Larrey off to Marshal Blücher’s headquarters where he was recognised and treated with respect having saved the life of the Marshal’s son after the battle of Dresden two years previously. Dominique-Jean Larrey died on 25 July 1842, three days after the death of Charlotte, his beloved wife of 48 years.